The recent release of a film adaptation of Atlas Shrugged has brought Ayn Rand’s fantasy of the world’s supermen abdicating from the role of stewards and leaders to a much wider audience. Within her frame, these men are noble and their decision to retreat into “Galt’s gulch” is an honorable response to the indignity and exploitation they’re exposed to. As others have noted, this fantasy doesn’t jibe with the current situation. While elites of yesteryear may have actually created wealth as titans of industry or ambitious innovators, today’s elites don’t make wealth, they take wealth. To borrow from another book by Ayn Rand, today’s elites are Ellsworth Toohey, not Howard Roark. And the “shrugging” that our White American elites are doing is less of a principled boycott than a manic fit of self-glorification. In the animated blockbuster Megamind, the presumptive hero “Metro Man” abandons Metro City to become “Music Man”, leaving the city to burn in the hands of the villains while indulging his juvenile hobby. This is a much better metaphor for the collective decision by our overlords to turn their backs on their stubborn and myopic White American minions. They’re not buckling under our burdensome demands as John Galt had been. They’re hellbent on making minions of the entire world, of upgrading from mere American elites to global elites. 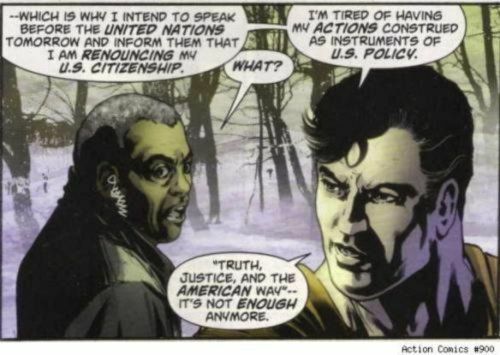 In an emblematic case of art imitating life, Superman will be renouncing his U.S. citizenship in the upcoming edition, stepping up from the lowly post of being the steward of a nation (and thus an implicit nationalist) to becoming an exciting new global superhero. He doesn’t answer to us — he answers to the United Nations. Bill Gates, Warren Buffett, Barack Obama, and the rest of America’s elite have preceded Superman in their own quests to take the wealth and power they amass in America and pour it into the “developing” world. It’s a truly bipartisan effort, with Former President George W. Bush and his wife lobbying for the Middle Eastern women they haven’t buried alive or vaporized to have more “women’s rights“. While elites the world over exploit and abuse their minions, ours have gone one step further: They’ve disowned us, even turned on us. In the warped cosmology of these Cosmic Americans, traditional White Americans are the oppressors, the historical villains accountable for the lion’s share of the world’s misery and dysfunction. Their prerogative is to reconcile this perceived injustice by robbing from the rich (other White people) and giving to the poor (non-White people). The future they envision is one in which they’ve not only bought the world a Coke, they’ve bought the world a laptop, some expensive AIDS drug cocktails, and some delusional aid workers. Renouncing us is a fateful decision on their part, as they need us more than we need them. While the Third World villagers will smile broadly and take the cargo America’s cosmopolitans are willing to part with, they won’t answer to them or do their bidding. … That’s our job, and we’ve just been fired. Islamic folks will still answer to Islamic elites. Chinese folks will still answer to their Mandarin minders. Africans would rather starve to death under Robert Mugabe than feed themselves and their families under the ominous shadow of the White farmer. The world is tribal. Humans instinctively strive for leaders who look like them and think like them. While it’s been proposed that Whites are inherently less tribal and more individualist than other races, I believe that White America’s historically anomalous streak of prosperity has allowed our tribalism to lie dormant — only appearing to be extinguished. When austerity comes to America, several decades of sublimated tribal tension will come bubbling to the surface and several million White Americans are going to ask the sorts of tough questions about identity and community that didn’t really seem to matter when there was enough food and shelter for everybody. When they ask those questions, we need to be ready to answer them confidently and persuasively. When they look for leadership, we need to have proven records of leadership and stewardship on their behalf — especially in this darkest hour of the White American national spirit. We can’t afford to wait for Superman to return. We who can see what’s happening have a moral obligation to try to lead our people toward a future worth showing up for. Sure, there are better looking, wealthier, more intelligent, and more eloquent people than you, but if you have the two simple things those elites don’t — an understanding of the problem and the courage to try to solve it — then you’re the only hope our people have. We have to adapt to our new reality and begin taking care of our people before they understand why we’re doing so and before they’re thankful for our sacrifices. We need to prove with both our words and our actions that we, and we alone, are the only candidates for leadership who will not renounce or betray the White American nation. Like Megamind, we have to get comfortable in a radically new role, one where we stop allowing ourselves to be framed as the villains, seize the moral high ground, and defeat the real villains.